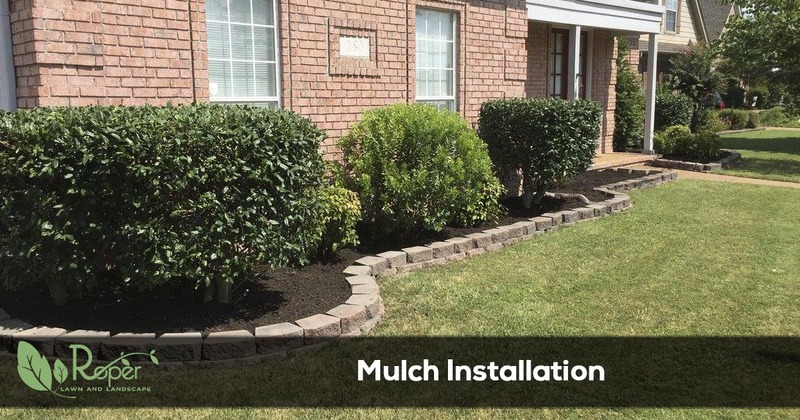 For affordable mulch delivery and installation services in the Memphis, Germantown, Cordova, Collierville, Bartlett, Lakeland and the Arlington Tennessee area call Roper Lawn & Landscape. Just one visit to your hardware store’s garden section will prove just how overwhelming landscape supplies become. How can you know which product is best for your yard care needs? Unfortunately, most chemical solutions and fertilization packages don’t achieve the results you had expected. They either burn out plants quickly, or they only produce minimal results. Instead, you may find that that mulch installation options of Roper Lawn & Landscape are just what your landscape has been missing. Mulching is an organic component that assists more plants to grow their best for longer. Call today for the best in local Memphis, TN, mulching installations! We use natural mulch created from recently ground wood chips and other organic components. As a result, your mulching performs better than items bought at the store. Mulching helps your landscape in a variety of ways, and it’s among the most inexpensive additives you can find! When we install our best mulching, it nourishes your plants without the need for harmful chemicals and sprays. Because mulching gets made from natural plant matter, it safely decomposes and sends nutrients down into the soil. And the wood chips are dense enough to prevent weeds from springing up! That means fewer herbicides are trickling into the soil creating better growing conditions for more plants. When your landscape needs better services, you can’t go wrong with organic mulch! Call today for your best delivery and installation services. We achieve the best results with better natural products! Did you know that mulching isn’t just nourishing, but it looks great, too? In fact, many people use mulching only because of its appearance! Most yards need a splash of color to look their best. Our mulching comes in natural wood, red mulch, black, and pure bark. No matter which one is best for your yards, we guarantee better performance and more affordable pricing. When you need your yard to look its best without spending too much, our team is here for you every time! Call today for the best in local mulching solutions for your home. We promise the best results with only the best products around! Chemical products work quickly, but their results fade just as fast. Once it rains, or your sprinklers kick on, the water ruins the application. Mulching, on the other hand, can last for months or even a year at a time. Even with their colors fade, you often can just flip them over! Organic mulch installations achieve superior protection without poisoning your landscape’s soil. When you need a fast solution that produces results, you need us to service your yard! Call Roper Lawn & Landscape today for your best mulch delivery and installation. You’ll love how your yard looks all year long!